Long hair. Leather. A fascination with the occult. House lights dim as a smokey haze rises. Someone spills beer on your shoe. Riff-driven sonic psychedelia bounces from wall to wall, very noticeably travelling through your ear canals on its supersonic yet sluggish coma-inducing journey. Welcome to the stoner rock concert. Friday for an evening of European psychedelic madness. Gothenburg hard-rock outfit Graveyard delivered an eclectic show, assisted by British act Uncle Acid & the Deadbeats and English alternative-rock openers Demob Happy. The timing was nothing short of perfect. With Trudeau’s recent green legalization still fresh to the city, its effect on the stoner rock culture could be seen in full force that night. From the sea of synchronized bobbing heads to the venue’s questionable air quality, this concert was very much a celebration of Canadian freedom and local drug culture. While the signs said to keep it nine meters from the door, I’m not sure people understood that didn’t mean towards the venue’s interior. 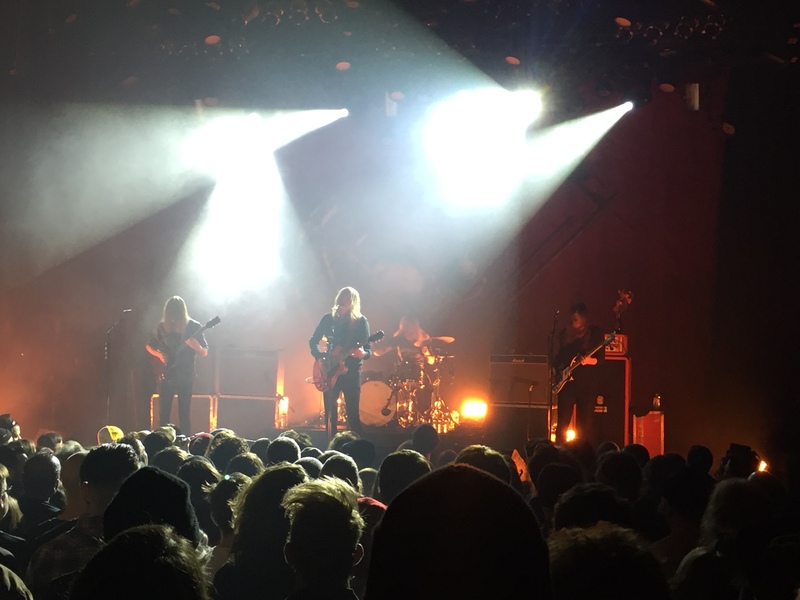 While Demob Happy’s daunting flavour of alternative rock served as a worthy competitor to Graveyard and Uncle Acid’s massive sounds, unfortunately they served only as an enjoyable prelude. It wasn’t a fair competition though, as with stoner rock, volume often triumphs over quality, and we all know that the sound guys turn the volume up a notch on the soundboard each time another band takes the stage. Uncle Acid & the Deadbeats conquered with their grooving southern/desert rock sound. Despite sounding fairly similar to contemporary acts such as Kyuss and Orange Goblin, with Black Sabbath influence oozing out of their performance, Uncle Acid’s constantly-rumbling tone was used to full effect during this show. All of their songs seem to be built around these groovy riffs that could entertain on repeat. Unfortunately, the keyboardist in charge of delivering the band’s ominous vibe could not be heard over the incessant guitar riffs and percussion hits, rendering him fairly useless. It’s a shame too, as it looks like they brought in a session keyboardist for this tour. While Uncle Acid and his rag-tag gang of long-haired bandits engaged in ceremoniously worshipping the riff for a little over an hour, Graveyard succeeded with longer song compositions, all ultimately detonating at their well-teased conclusions. Starting at a mellow pace, building up through song progression, and finally leading to an intense sonic culmination seems to be Graveyard’s bread and butter formula. The general rule is that live performances usually sound better than songs in-studio, especially with how loud these bands get. Graveyard was no exception. It was one of those incrementally-surprising evenings. I haven’t been to a show in a few months, so the familiar air and concert atmosphere got me pumped up during Demob Happy’s performance. Uncle Acid & the Deadbeats followed suit; most people seemed to be enthralled in the group’s incessant riffing. I thought that was the night topper, but of course Graveyard stole the show in momentous fashion. This is not a tour to miss, and I don’t even smoke. Imagine what a stoner would say.